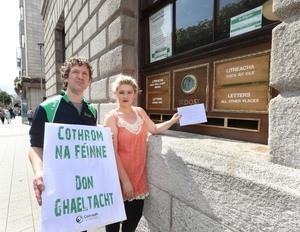 Conradh na Gaeilge are seeking a meeting with An Post, with the Minister for Communications and with the Minister for the Gaeltacht to ensure that An Post will “not end services through Irish in Gaeltacht areas as part of their current redundancy process, and to see that Gaeltacht communities will not be denied essential services through Irish”. Posted in Misc and tagged An Post, conradh na gaeilge, Irish Language at 3:03 pm on August 3, 2018 by Bodger. There was a fall of under 1% in the numbers of speakers of Irish (from 1,774,347 to 1,761,420). 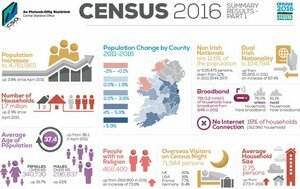 A fall of 4% in the number of daily speakers of Irish outside of the education system (from 77,185 to 73,803). 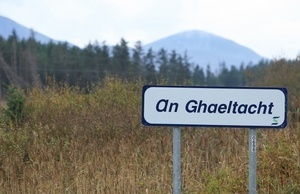 And and a fall of 11% in the number of daily speakers of Irish in the Gaeltacht (from 23,175 to 20,586). It is clear that the implementation of the Government’s 20 Year Strategy for the Irish Language is not succeeding and that the main reason for this failure is the Irish Government’s lack of investment in the Strategy since 2010. The result of this lack of investment is a crisis in the Gaeltacht. 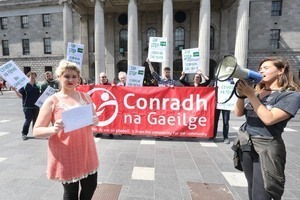 Conradh na Gaeilge is asking the Government to face up to the challenge reflected in the census figures by funding the investment plan agreed by 80 Irish language and Gaeltacht groups. A majority of Teachtaí Dála are in favour of this investment already. 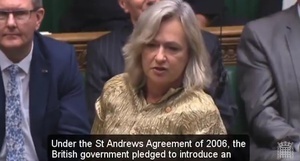 This plan would increase the number of Irish speakers and would give the Strategy a chance of success. Posted in Misc and tagged conradh na gaeilge, Irish Language at 1:46 pm on April 6, 2017 by Broadsheet.